Nutrient inputs generally are increased by human-induced land use changes and can lead to eutrophication and impairment of surface waters. Understanding the scale at which land use influences nutrient loading is necessary for the development of management practices and policies that improve water quality. 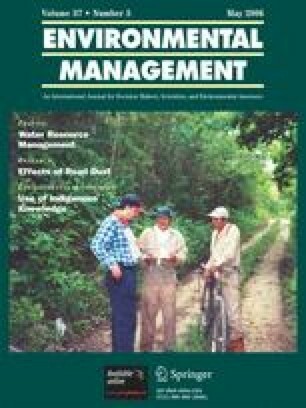 The authors assessed the relationships between land use and stream nutrients in a prairie watershed dominated by intermittent stream flow in the first-order higher elevation reaches. Total nitrogen, nitrate, and phosphorus concentrations were greater in tributaries occupying the lower portions of the watershed, closely mirroring the increased density of row crop agriculture from headwaters to lower-elevation alluvial areas. Land cover classified at three spatial scales in each sub-basin above sampling sites (riparian in the entire catchment, catchment land cover, and riparian across the 2 km upstream) was highly correlated with variation in both total nitrogen (r2 = 53%, 52%, and 49%, respectively) and nitrate (r2 = 69%, 65%, and 56%, respectively) concentrations among sites. However, phosphorus concentrations were not significantly associated with riparian or catchment land cover classes at any spatial scale. Separating land use from riparian cover in the entire watershed was difficult, but riparian cover was most closely correlated with in-stream nutrient concentrations. By controlling for land cover, a significant correlation of riparian cover for the 2 km above the sampling site with in-stream nutrient concentrations could be established. Surprisingly, land use in the entire watershed, including small intermittent streams, had a large influence on average downstream water quality although the headwater streams were not flowing for a substantial portion of the year. This suggests that nutrient criteria may not be met only by managing permanently flowing streams. We thank Dolly Gudder and for technical assistance, and Lucinda Johnson for comments on the manuscript. We thank the USGS Gap program and the Konza NSF LTER program for funding. This is publication 04-260-J from the Kansas State University Agricultural Experiment Station.